1909 Waterloo 1815, 175th Anniversary medal 1990 after Pistrucci, struck by J.Pinches, silver, 63mm., numbered 1367. Edge knock otherwise GVF. Together with a square Austrian medal 1910, silver plated. 967 Signing of the Armistice, Tenth Anniversary Medal 1928, struck by the Royal Mint, silver (547 struck), 76mm. (Eimer 2008). In damaged case of issue, stain to obverse otherwise GVF. 915 India, Military & Police medals (4), 25th Independence Anniversary Medal 1947-1972, Azad - Kashmir Commemoration Medal 1947-49 bronze, 20 Years Long Service Medal named to 2477713 NK Shri Ram Punjab R., 1965 Semar Seva Star Bronze to Const. Jag. Roop Singh R.P. . GVF. 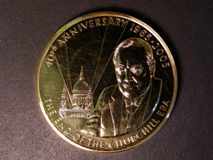 1016 City of London 800th Anniversary of The Mayoralty 1989, Royal Mint issues in silver and bronze, each 63mm., silver issue in case. EF. (2).